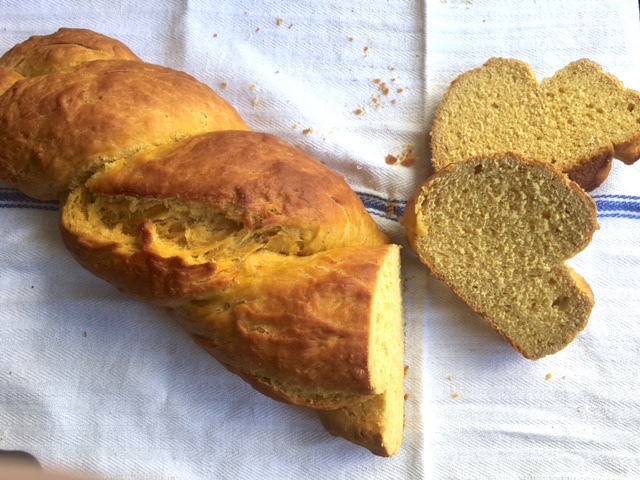 This traditionally dairy free sweet bread (tsoureki) was made during the winter months when eggs and butter were less available, using autumn harvested pumpkins. Greek sweet breads are most often braided and have a moist, denser crumb than regular table bread as well as being just slightly sweet 🙂 This one is especially flavorful and amazing all on it’s own or slathered with your favorite jam. And don’t be afraid of making your own bread – it’s not difficult at all and this is a great recipe to start your homemade bread making career with! slice of pumpkin sweet bread with fig jam! Couple of things about this recipe. You’ll notice that the method of yeast proofing I use for bread is a bit different from other yeast doughs/batters on The Greek Vegan. It yields a sturdier proofed yeast that, I think, better stands up to mixing-in with the rest of the recipe’s ingredients. It’s just one very small step more and adds only an additional 10 minutes to proofing time. In the end, it yields a proofed yeast more closely related to traditionally used the wet (or sourdough starter) leavener that makes all Greek breads so good. 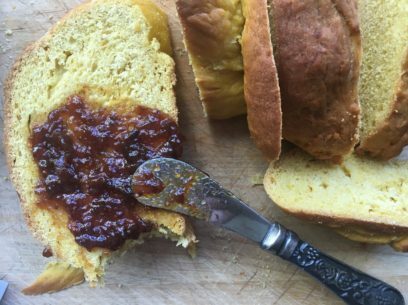 The sweet pumpkin, smoky spices, bright citrus and vanilla make this sweet bread a treat for the tastebuds. Oh, and try toasting it for breakfast! FYI, everything mixes together in one bowl so not a lot of mess. quick and easy cleanup with one bowl mixing! Braiding the dough is very easy too. You’ll roll out two equal length ropes about 18-20″ long, lay side by side, pinch the two pieces together at the top and simply twist! And make sure to check out my fantastic quick and crazy-simple kitchen hack after the recipe instructions below that turns your regular oven into a fancy bread baking, crust creating machine! In a cereal-sized bowl, mix the water with a tiny pinch of sugar (maybe ¼ tsp) and sprinkle the yeast over top. Let this sit for 10 minutes and stir to completely combine. Measure out your flour in a large mixing bowl, scoop out a deep well in the center and set aside. When 10 minutes are up for yeast mixture, add in 2 tbsp of set aside flour along with salt and mix until you get a thickish paste. 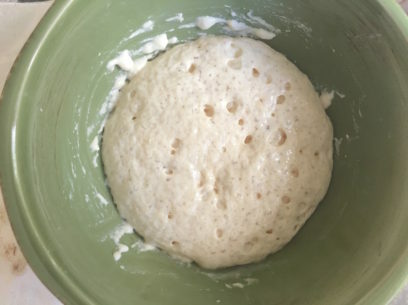 Cover and let this rise for 30 minutes and you’ll have a bubbly, beautiful, sweet smelling ball of yeast in no time! Now, while you yeast is proofing, mix together the mashed pumpkin, spices and sugar in a medium bowl until sugar is completely dissolved. Stir in oil and combine well. Add orange juice, zest and vanilla extract. Stir to combine completely and set aside. When yeast has fully proofed, get out your flour bowl and pour in the pumpkin mixture and then the yeast into the well. Mix all of this together until, after about 3-4 minutes, it comes together in a rough, crumbly dough. Knead the dough for approximately 8-10 minutes until it becomes a smooth ball. This is based on kneading by hand. I’m sure you can also knead with mixer and dough hook, just not of the times. Place kneaded dough ball back into bowl, cover with cloth and let rise in a warm place for 1 hour. The dough should almost, but not quite, double in size. Once risen, turn dough out onto clean counter/surface, knead for just a minute and cut dough into two equal pieces. Try to use no or minimal flour when rolling out dough. Roll each piece in a rope of about 18-20” long. Lay the 2 ropes next to each other, pinch them together at the top and twist the ropes into one braided loaf. Gently transfer braided loaf onto sheet pan, cover and allow to rise in warm place for a final 30 minutes. Once risen, lightly brush risen braid with sunflower oil and bake in 350 degree oven for 35-40 minutes. The loaf should be high, a beautiful golden brown and the bottom should be just lightly browned. Remove from oven and allow to sit for at least 10 minutes before enjoying. It’s hard to wait, I know, but it will still be plenty warm I promise! 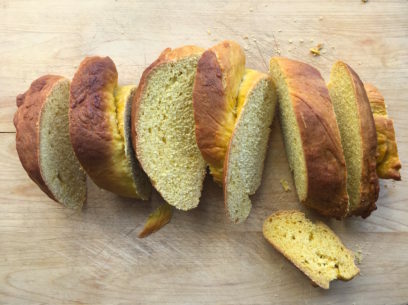 I like this sweet bread best after it’s had a bit to sit – even as long as the next day if it’s kept covered with a towel on the counter overnight. This loaf will yield 10 generous slices! I cannot wait to try this recipe. Especially with fasting coming up soon. Thank you! Looks delicious! Can the pumpkin be replaced by sweet potato? You know, I’m pretty sure you could! I’ve used mashed butternut squash before and that works nicely, just a little less flavorful to me. Let me know how it turns out! Could you substitute honey for the sugar? I can’t wait to try this! 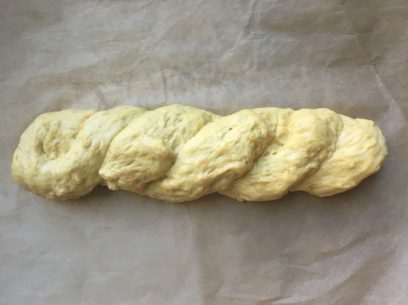 I’ve never made bread before and really miss traditional tsoureki. This looks delicious! Will definitely try in during the Nativity fast. I substitute 1 tablespoon of sugar for one of honey in my sourdough bread recipe and it works fine! I just wanted to say that I love the measuring units for Greek recipes! The way you describe the bowls to use reminds me of my mom’s Easter tsoureki recipe, which calls for “one water glass of milk”. 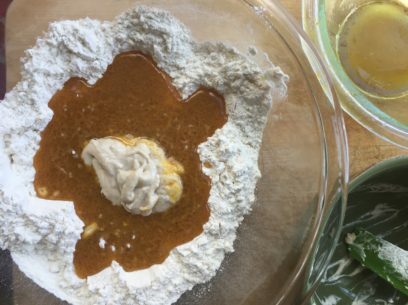 I look forward to baking and eating this pumpkin tsoureki!